Erika Pierce competed for the University of Virginia and then went on the 1996 Olympic trials before hanging up her spikes. At the time, she thought retirement would be permanent. Erika Pierce had spent much of her life on a track, through high school and college. 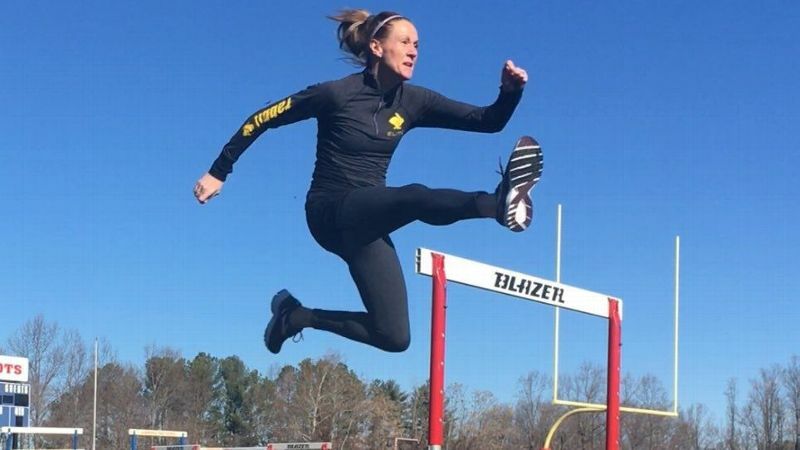 But after running the 400-meter hurdles at the 1996 Olympic trials, the former University of Virginia standout stepped off the track in Atlanta and figured she'd never run again. "I think I just literally thought that was the pinnacle of my athletic career, and how could I do any more than running in the Olympic trials," she says. For 17 years, Pierce didn't once put on her spikes. She pursued her career in teaching, got married, had two daughters and stayed active by playing soccer, softball and basketball. Then, one day, a friend told her about masters track and field. She'd never heard of it but the idea of competing again -- against women in her age group -- was exciting. Immediately, she began training for a comeback. She'll never forget the day in 2013 when she entered her first meet, an indoor event. "It was like finding an old friend you hadn't seen in a long time," she recalls. "Just having so many emotions and memories." She savored every smell and sound. She felt at home among the athletes, volunteers and officials. Even the nerves and anxiety she experienced when she settled into the starting blocks was exactly what she wanted. "I was at home," she says. Erika Pierce, goofing off in practice here, teaches social studies and also acts in community theater productions. Five years later, Pierce, 46, has excelled. She's won 12 national age-group championships in a variety of events -- the heptathlon and pentathlon, 60-meter hurdles, 400 hurdles, high jump and javelin -- and set U.S. masters records in the indoor heptathlon (women's age 40 division) and indoor and outdoor heptathlon (W45). Yet more important than records or titles to her is the joy she gets from track and field. "I think it's brought to my life a renewed sense of self," says Pierce. "I think especially women as they approach an older age sort of lose confidence in their ability to do new and fresh things. It's sort of like you're in a rut. I definitely remember being in that rut and trying to find something to ignite a spark or get passionate about something." Pierce, a native New Yorker who lives in Charlottesville, Virginia, strives for new challenges and a full schedule. As she says on her blog, Running Over Hurdles, "I refuse to believe I can't do it all. And all really well." She has a master's degree and Ph.D. from the University of Virginia, where she once taught, but now teaches social studies in middle school in Charlottesville. "I love being with kids that need you rather than being at the university level," she says. "I love being back in the classroom with kids." 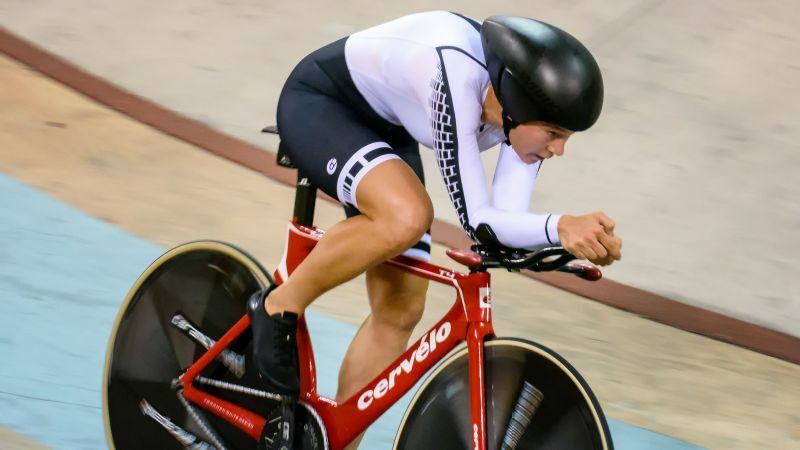 Six days a week she trains an hour to an hour and a half, mostly before and after work, with a combination of track workouts, hill runs and home sessions filled with crunches and pushups. Once a week, she takes a ballet class, getting back to her childhood roots, when she danced long before she began running. And, about every other year, she auditions for local theater productions where she can dance, sing and inject something completely different into her life. Last year it was the musical "Chicago." "People in community theater are beyond passionate about what they do, and I enjoy being around them," she says. "They're funny, generous and love what they do and that gives me energy. I love seeing people that love what they do. I'm attracted to people who love life, and theater people love life." It's all mixed in with time spent with her husband, James, and daughters Elaina, 10, and Juliana, 8. Often, she says, track takes a back seat to family. 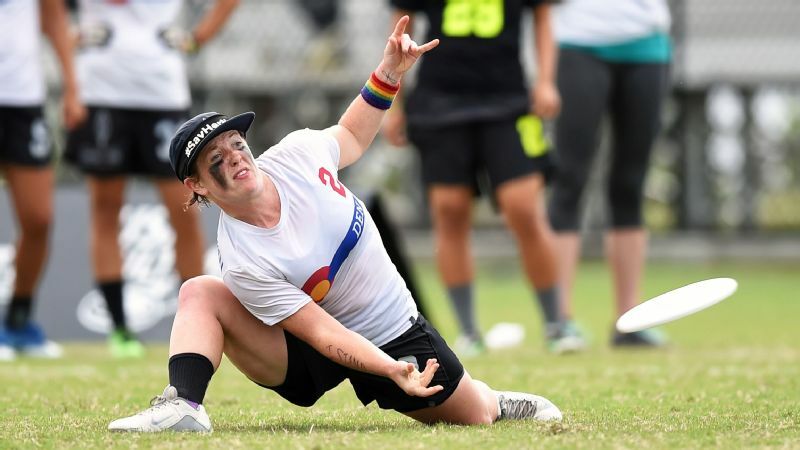 She limits competition to just five or six meets a year, and recently decided to pass up the indoor nationals because she wanted to attend one of her daughter's first soccer game. "I have to have that balance," she says. "I have to pick and choose what things I focus on." It's the same in track. Each year, she picks an event as her priority. This year, it's the 400-meter hurdles. When she first went to Virginia on a track scholarship, as Erika Pietrzak, that was her main event, but in her second season, coaches asked her to transition to the heptathlon and pentathlon (she still ranks No. 8 all time at the school in the pentathlon). After college -- while coaching for a while at James Madison -- Pierce again trained in the 400-meter hurdles and qualified for the Olympic trials, where she ran 59.56 in her final race. Now, she's again concentrating her efforts on it and hopes to set the U.S. record in her 45-49 age group. The record is 67.09 seconds. 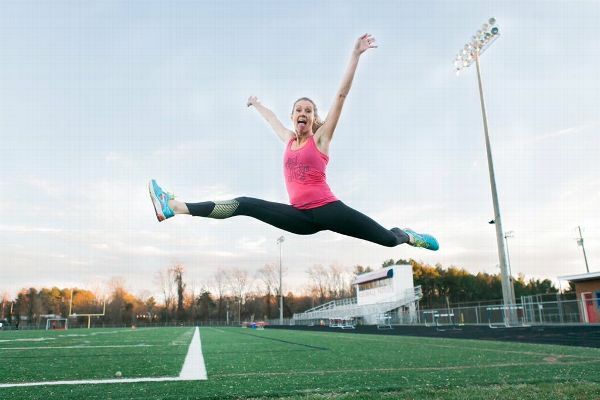 She's run a 65.21, but not in a sanctioned meet, so she believes she can do it. "The 400 hurdles is a beast, right?" she says. "Many would say it's the hardest event on the track because you're sprinting and not only sprinting as hard as you can in the 400 -- which is a tough race -- but now these hurdles are in front of you." The key for her is her mental approach. 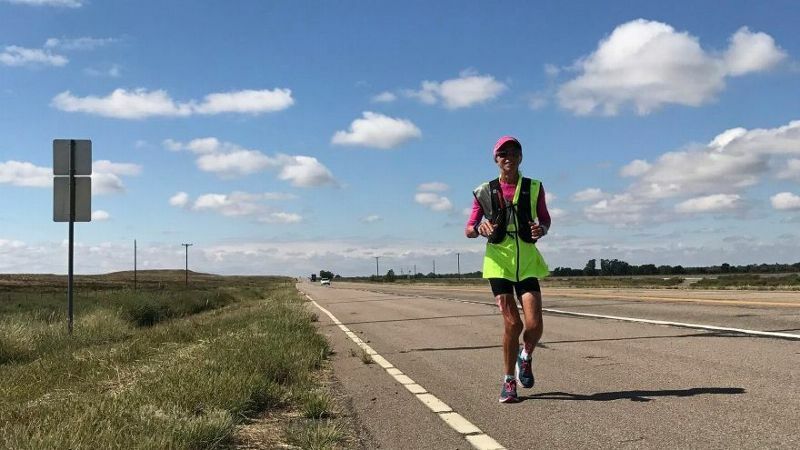 She has to go into a race with a plan, to be completely comfortable with the steps and cadence between each hurdle and be ready to deal with the fatigue that sets in over the final stretch. "Just praying you're going to make those hurdles, that you're going to clear them because your legs are completely dead," she says. "It's a challenge, but I think the mental aspect of the race is what I practice. Knowing what to expect at every part of the race." Pierce trains differently than she once did. She realizes rest is more important now that she's in her mid-40s, and she stops or scales back workouts if she doesn't feel right. Where once she might have done eight reps of the 200 meters, now she'll do four or five. And she won't run through pain. "I just don't take the chance," she says. "I'm so much more conservative in my training." Pierce says one benefit of competing again has been that her daughters have been able to see so many different sides to her life. "I'm able to show my own daughters that being a parent is complicated and it's not just about the family, but it's about finding your own happiness as an individual, and lifelong growth," she says. "I feel like being able to model that to my daughters is helpful and healthy."